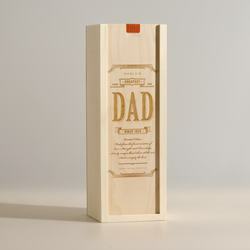 Personalized wine box gift for Dad.Â You've known for some time that he is the greatest. Now you can properly honor him with this awards style box complete with dating the year he became the "World's Greatest Dad." He is sure to enjoy a great bottle of whiskey, scotch, or wine cradled in this box. Donâ€™t forget to engrave your personal note telling him exactly why heâ€™s the greatest.